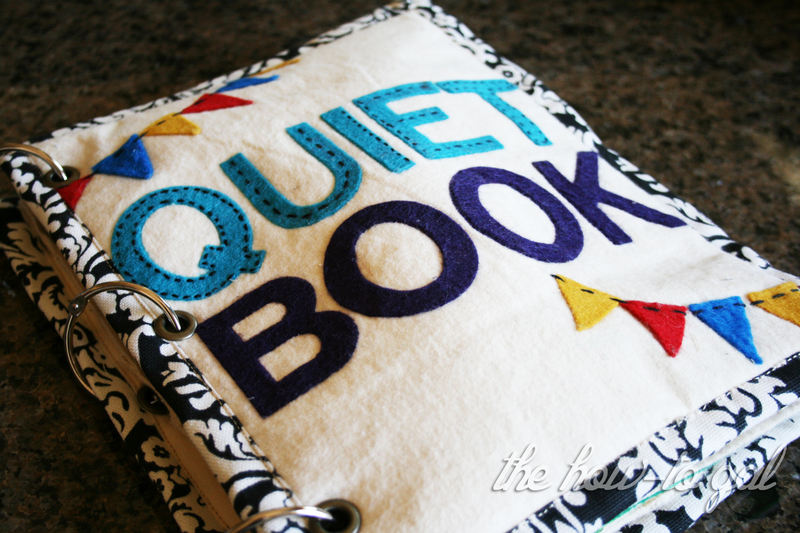 The How-To Gal: Finished Quiet Book! After months and months of attempting and procrastinating, I'm finally finished with little E's quiet book. I only finished six total pages, but I decided six pages were better than having an uncompleted project staring at me every time I approached my craft table. The book is held together with grommets and book binder rings. With the grommet design I can always add more pages later! I bought a package of Dritz 1/4" eyelets, an eylet tool and book binder rings from Wal-Mart for approx $5. I purchased one yard of a soft cream utility fabric for $5 and the rest of the fabric, felt and other supplies, I had on hand. The peas each come out and reattach via velcro. Each flower's center is a magnet that the little lady bug (and soon to be bumblebee) can land on. There is also a magnet sewn into the grass for the insects to land on. I found all of these zippers at Savers for $0.25, score! Took them home and sewed them into place on the page. Hand-stiched "Zip-a-dee-do-da." I went to local scrapbook store that lets you die cut fabric and cut the letters out in a six color rotating pattern. Or if you have a Silhouette or Cricut, lucky you, simply cut the letters out at home. I then affixed wonder-under (Pellon) to each letter and with a ruler, ironed in place. Hand-stitched "trace the letters." I cut the numbers out with a die cut machine. Then I affixed the numbers to squares of felt with pellon. I pinned the numbers into place and sewed them into place on the page with my sewing machine. Under the numbers I hand-stitched buttons to correspond with each number. To add to the "laundry" feel, I used Fabri-Tac to glue a piece of lace across the top of the numbers. The book was going to be wrapped and given to my little girl for her birthday (in July) and then when I didn't finish in July, for Christmas, but she has seen every page and loves it...so I'm giving it to her early -or late depending on how you look at it!!! Love your page ideas! How did you get the Things in the felt? That's an awesome idea to hold it together! Thanks! I cut all of the felt shapes out at a local scrapbook store (Pebbles in my Pocket). They have a manual die cutting machine that you can use with fabric. Was there a machine to put the rings in the felt? Perhaps something a Walmart that would be similar...? Oh! Sorry, I thought you were talking about the felt shapes :) The grommets were put in using a little grommet tool you can buy from Wal-Mart. I think the little tool and the grommets cost me, total, $4. Super cheap and easy! Perfect! Wonderful idea to save the pages! Thanks so much! can you tell me how you put your pages together? is it two pieces of fabric stitched together then cut around? I made these pages by sewing two pieces of soft cotton fabric together. I put the right sides facing each other, sewed around the edges leaving a small opening. Then I turned the page right side out and top stitched around the edges to sew up the hole. Just like you would for a pillow case or something similar. Does that make sense? Love your quiet book! I want to make one for my daughter but I feel so intimidated! We're the grommets hard to do? Don't be intimidated! You can do it Kristin! The grommets were actually my most favorite part. Buy yourself a grommet kit from Joann's, Wal-Mart or any fabric shop and you won't regret it. SO. MUCH. FUN! I didn't reinforce the grommets, but haven't had any problems so far. As for the page size, the cover is 8in x 10in and the pages are about the same size, just a bit smaller. Just wondering, how did you make your cover for the book with the contrasting fabric on the edge? Thanks Lynn! To be honest, I kind of winged the cover and didn't take pictures of the process. However, all I did was measure a piece of fabric a few inches larger than my front piece and sewed the pieces (wrong sides) together, just like you would a blanket. I left the bottom side open enough for me to flip the right sides out. Then I pressed the page with a hot iron so that the patterned fabric bordered the title page. I hope this helps and isn't too confusing! What size grommets did you use? I am trying to finish my quiet book. Much appreciated Lynn! should a chance to be honest, i sort of winged the spread and didn't take portraits of the methodology. However, every one i completed might have been measure An bit for fabric a couple inches bigger over my front bit Also sewed the bits (wrong sides) together, simply similar to you might An cover. An i am looking to and i need to post a comment that "The substance from claiming your post may be magnificent".